Cape Hearing Implants (CHi) is a recently founded collaboration of independent, private healthcare service providers that specialize in implantable hearing solutions. CHi provides a professional and comprehensive service for the identification, surgical implantation and rehabilitation of patients with hearing loss. Motto: Combine committed, experienced PROFESSIONALS with advanced, unique TECHNOLOGY and you can expect UNRIVELED HEARING. According to the World Health Organization (2018) over 5% of the world’s population, or 466 million people, has disabling hearing loss (432 million adults and 34 million children). It is estimated that by 2050 over 900 million people, or one in every ten people, will have disabling hearing loss. Implantable hearing solutions give hope and accessibility to hearing that would in some cases otherwise not have been possible through surgery, medication or conventional hearing aids. What is an implantable hearing solution? Implantable hearing solutions are aesthetically pleasing, highly sophisticated, mechanical hearing devices that are surgically implanted in patients who suffer from hearing loss. It does not replace the conventional state of the art hearing aids but serves as an alternative to those patients who do not optimally benefit from hearing aids or who, due to anatomical restrictions, cannot wear hearing aids. There are different types of implantable hearing solutions on the market catering for all types and degrees of hearing loss. Patients with conductive-, mixed- and sensorineural hearing loss and single sided deafness (SSD) may qualify. One of the first implantable hearing solutions that were used was none other than the cochlear implant (CI). What are the different implantable hearing solutions available? There are 4 walk in practices in Cape Town. The 4 practises are located in Netcare Christiaan Barnard Memorial Hospital, opposite Louis Leipoldt Mediclinic, Netcare Kuils River Hospital and Netcare Blaauwberg Hospital. Who are the service providers of CHi? The service providers of CHi mainly include ear-, nose- and throat surgeons, audiologists, speech therapists, psychologists and other co-opted medical specialists working with patients with hearing loss. All professional involved with the management or treatment of a patient receiving an implantable hearing solution is registered with the HPCSA. The surgeons, audiologists and speech therapists are also members of the South African Cochlear Implant Group (SACIG). Regular CHi team meetings are conducted to discuss all the aspects regarding implantees. Which services will be offered by CHi? An all-inclusive service will include eligibility for an implant (candidacy), councelling, applicable trials, medical motivations, surgery, follow up implant programming and rehabilitation. Do I qualify for an implantable hearing solution? 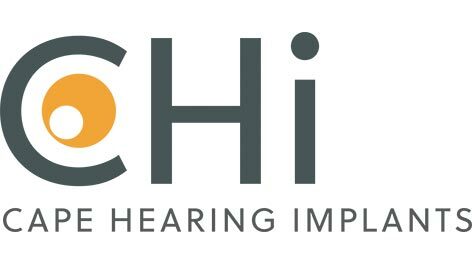 Any person who would like to know whether they are a candidate for an implantable hearing solution may contact any of the 4 branches of CHi for an evaluation. If possible, candidacy is established an appointment is scheduled with one of the surgeons to review all the medical aspects and perform a clinical examination. A computed tomogram (CT) scan and in some cases a magnetic resonance imaging (MRI) may be requested to evaluate the anatomy of the ear not vissible to the surgeon during clinical examination. Will my medical aid pay for an implantable hearing sollution? Many of medical aids in South Africa will cover the costs but this depends entirely on the specific medical aid and the plan that a patient is on. It is advised to enquire about this option at your medical aid. CHi can help with this process and will supply all written motivations required by the specific medical aid. Where can I read more about implantable hearing solutions? Cape Hearing Implants (CHi) celebrates World Hearing Day.